In mainstream media outlets, oil sands mining has drawn relatively scant attention within U.S. This may stem, in part, from a greater focus on the ongoing financial crisis or other, more immediate U.S. interests. But perhaps it also reflects the remoteness of the Oil Sands and the vast distances between our most populous centers and the 175 billion barrels of proven reserves in the Canadian north. Recently, this situation has shifted in the context of an increasingly contentious debate over whether the Obama administration should approve a huge pipeline expansion called the Keystone XL. The proposed pipeline would establish a sprawling link between these far northern reaches and southward, across the entire breadth of the U.S., reaching Texas and the Gulf coast refineries. 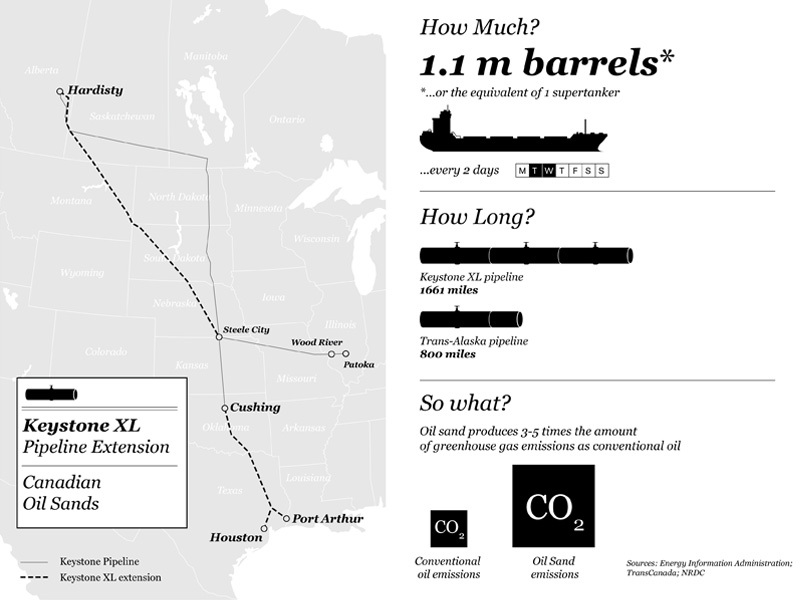 The Keystone XL would serve to deliver an additional 1.1 million barrels of Canadian crude oil from Alberta. This would be in addition to the 1.9 million barrels that the U.S. currently imports from Canada. With this added volume, oil sands from the Alberta mining operations are expected to be America’s most important source for imported oil this year. Currently the U.S. is the primary customer for oil sands. While Canadian oil represents fossil fuel from a stable and friendly neighbor, oil sands opponents such as the NRDC point out the external environmental costs. With 3-5 times the amount of greenhouse gas emissions than conventional oil and vast quantities of water required for extraction and processing, these costs may outweigh the economic and political benefits of a U.S. and Canada energy trade. Last Friday the period for public comments closed and the administration will spend the next few months reviewing the flood of statements submitted by Congress, conservationists and landowners concerned with the physical footprint and environmental risks associated with the expanded pipeline network. An official decision will be presented at the end of the year. In the meantime, the most important question for the Obama administration will be whether or not Canadian oil is consistent with the agenda for a 21st century clean energy economy and how such a debate may allow us to critically assess the practical limits of energy independence.